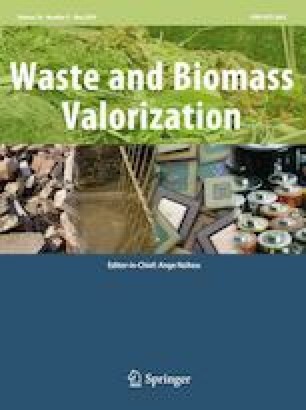 The influence of the fertilization level and soil type on the energy efficiency of the biogas production from maize, sorghum and reed canary grass silages were studied in this work. The plant material used to prepare silages was obtained from the experimental field with light, medium and good soil. High yields of biogas were obtained from maize silage with the lowest fertilization level of 80 kg N ha−1 from 194.5 up to 315.33 m3 t−1 green mass (g.m.) depending on soil quality. The highest biogas yields of sorghum and reed canary grass were lower (about 120 m3 t−1 g.m.) than that for maize. 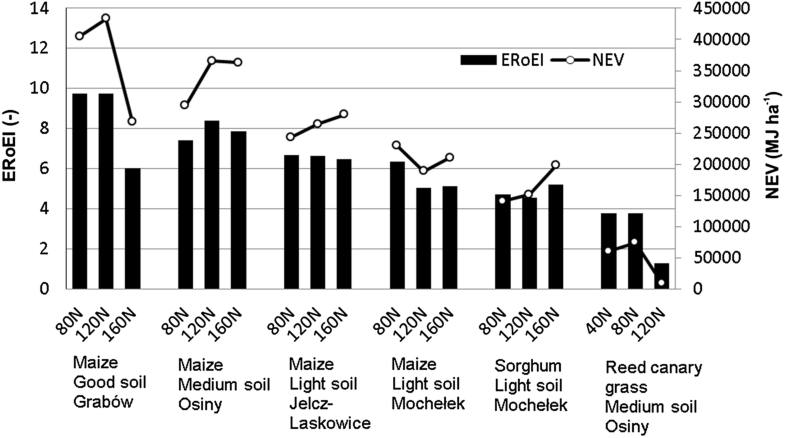 Depending on the soil type, the Energy Return on Energy Investment index (ERoEI) and the Net Energy Value (NEV) values for maize ranged from 5.05 and 189 000 MJ ha−1 (light soil), obtained at the level of 120 kg N ha−1 to 9.76 obtained at the level of 80 kg N ha−1 and 433 000 MJ ha−1 at the level of 120 kg N ha−1 (good soil). For sorghum (light soil) values of about 5.2 and 200 000 MJ ha−1 were appropriately obtained at the level of 160 kg N ha−1. In the case of reed canary grass the highest ERoEI and NEV values obtained at the level of 80 kg N ha−1 amounted to 3.8 and 74 000 MJ ha−1 (light soil), respectively. The investigations indicate that in general, the production technologies of crops where the low levels of nitrogen fertilization were applied proved to have the highest energy efficiency. Taking into account, that nitrogen is one of the most important limiting factors for crops production, N fertilization can be important management practice for their biomass yield potential and quality. Yet, there is still a lack of information regarding impact of N fertilization on biomass yield of energy crops growing on soils of different quality and none of the researchers examined the effect of nitrogen fertilization level on biogas production and thus the energy efficiency (energy costing). When the world in XXI century faces problems with growing energy consumption and reducing fossil fuels it is essential to develop suitable cultivars of crops being renewable sources in order to obtain maximum yield of methane production per hectare, all the more so because in recent years more and more attention has been paid to the usefulness of crops for industrial purposes [1, 2, 3]. Therefore, it is necessary to conduct research aimed at the evaluation of the energetic efficiency of the technologies related with the production of biomass for energetic purposes [4, 5]. The most important parameter in choosing crops for methane production is the net energy yield per hectare, which is defined mainly by biomass yield and convertibility of the biomass to methane. This may result in different harvesting strategies when growing energy crops for anaerobic digestion. Specific harvest and processing technologies and specific genotypes are required when crops are used as a renewable energy source. Ideally, energy crops should offer a high dry biomass yield at a low cost, a composition with the least contaminants such as soil and should require low nutrient and energy inputs . It should also offer a low sensitivity to pest and a good soil cover, while not decreasing the biodiversity. However, the use of those energy crops which are used as food products for biofuel production is an important issue which must be considered in terms of the current food safety. Nowadays, the development of specific crops dedicated to energy has been proposed as a strategy to produce energy without affecting food security and the environment. One of the important aspects of promoting plant cultivation for energy purposes is the possibility of using and managing chemically degraded soils and uncultivated lands [7, 8]. Potentially sustainable bioenergy may be obtained from various energy crops [9, 10]. Many varieties of grass, clover, cereal and maize, as well as rapeseed or sunflower have proved to be a suitable substrate for biogas production . In practice, maize is currently the most used energy crop for biomethanation because of its high biomass yield, good conversion rate into methane and easy storage as silage . However, Venuto and Kindiger  reported that forage sorghum and sorghum-sudan grass hybrids have potential for increased biomass yields. There is a growing interest to cultivate reed canary grass for bioenergy production as it can be grown under water logged conditions and under colder climatic conditions . Energy crops are very suitable substrates for methane fermentation, but for the biogas plant to be profitable, methane yield from energy crops must be known [14, 15, 16]. Improving biomass yield of dedicated energy crops on a limited cultivation area is cited as one of the possible strategies for achieving an effective and sustainable use of bioenergy . For bioenergy cropping systems, the use of N fertilizer is a key agricultural management practice for improving productivity and profitability [17, 18]. Nitrogen (N) availability has been most frequently reported as the limiting factor for growth of native grasses, suggesting that N fertilization can be an important management practice for energy crops biomass production and feedstock quality [19, 20]. Yet, there is still a lack of information regarding impact of N fertilization on biomass yield of energy crops, growing on soils of different quality. Modern cultivation programs aim at increasing the digestibility of plants, as still great opportunities exist to improve this feature. It is therefore important to assess the suitability of potential energy crops for biogas production in order to achieve the best possible output, since the justification for the economics of biogas production depends on the yield magnitude. Apart from cost-related energy efficiency the costing is an important element in the assessment of biofuel production. The advantage of energy costing is its independence of price relations, which enables a comparison of findings in different research centers. In this paper the effect of nitrogen fertilization level and soil type on the yield and production of biogas from maize silages was determined. The susceptibility to anaerobic digestion and the usefulness of the biogas production from maize silages were also compared with the sorghum and reed canary grass crop silages. In order to assess the energy efficiency of the investigated crops, the Energy Return on Energy Investment index (ERoEI), also known as the Energy Return on Investment (ERoI), and the Net Energy Value (NEV) ratio were used. The field experiments on selected maize (Zea mays L.), sorghum (Sorghum Moench) and reed canary grass (Phalaris Arundinacea L.) were carried out in this study. The plant material used to prepare maize and sorghum silage was obtained from a field of light soil (5–6 complex) in Mochelek locality, Poland (N: 53°13′23.63″, E: 17°52′21.41″). On the other hand, from experiments on light soil (5–6 complex) in the locality of Jelcz-Laskowice, Poland (N: 51°2′35.27″, E: 17°21′23.59), on medium soil (4–5 complex) in Osiny, Poland (N: 51°27′59.98″, E: 21°39′44.28″), and on good soil (2 complex), in Grabow, Poland (N: 51°20′58.23″, E: 21°39′44.28″) maize silage was harvested. Plant material used for the preparation of reed canary grass silage was obtained from a field experiment located in the medium soil (4–5 complex) in Osiny, Poland (N: 51°27′59.98″, E: 21°39´44.28″). The experiments were conducted in a randomized complete block design in “split-plot” system, with 4 replications. Depending on the investigated plant and allowing for fertilization requirements the following levels of nitrogen fertilization were assumed in the research: for maize and sorghum: 80, 120 and 160 kg N ha−1, for reed canary grass: 40, 80 and 120 kg N ha−1. The content (mg 100 g−1 soil) of assimilable phosphorus, potassium and magnesium was respectively equal to 14.7–22.6, 12.0–17.0 and 2.3–12.2, humus content 1.2–1.6% and pH 5.3–6.4. Phosphorus and potassium inputs varied from 60 to 72 kg ha−1 and 72 to 100 kg ha−1, respectively. The seeds were sown in optimal time with a single seed drill at a rate of 130 thousand ha−1 for maize—130 thousand ha−1, from April 26 to May 12, and sorghum—220 thousand ha−1 from 9 May to 8 June. Before sowing, the seeds were treated with insecticides and fungicides. There was also applied chemical weed control. Maize was harvested on 7–11 September, and sorghum on 19–28 October. Reed canary grass seeds were sown on 24 April in the amount 25 kg ha−1 in row with spacing of 12 cm to a depth of 1.5–2.0 cm. Crops were harvested in two swaths: second decade of June and third decade of October. Weather conditions for conducted field experiments are characterized in Table 1. Both the amount together with rainfall patterns and thermal conditions were close to the average for many years, which did not significantly differentiate the yield of plants and as a result of biogas yield. The evaluated species were grown for silage, which was the material for further research on the potential of biogas production. The freshly chopped plant material was pressed into a plastic barrels with a capacity of 50 dm3 and tightly sealed in order to realize anaerobic conditions. The yields of green and dry mass were determined. Dry matter and dry organic matter (VS) content was determined on the basis of Standard Methods . BMP tests were carried out in batch mode in 1 dm3 glass bottles following the guidelines proposed by Angelidaki et al. . Based on the results of preliminary studies for silage the initial load of the reactor with dry matter and organic matter was selected. The inoculum-to-substrate ratio (ISR) on an organic matter (VS) basis was set at 2, and the substrate concentration was equal to 5 kg VS m−3. Blank bottles were set by adding inoculum only. The reactors were flushed with a gaseous mixture of N2/CO2 for 5 min each to ensure anaerobic conditions. Bottles were sealed with a rubber stoppers and placed in a shaker (60 rpm) with thermostat maintaining the temperature of 37 ± 0.5 °C. The reactors ran until the daily biogas production was less than 1% of the cumulative production of biogas (about 40 days). Each sample was performed in triplicate and the arithmetic average was taken for data interpretation. Daily gas production from each digester was measured by using a water displacement method. The level of gas in the collector was read every 24 h and it was then reduced to dry gas at standard temperature and pressure (STP) conditions . Water vapor pressure was calculated using the relation proposed by Strömberg et al. . Methane content of the corrected biogas volume was determined via gas chromatography using a SRI 8610C gas chromatograph (SRI Instruments, USA) equipped with TCD detector and two chromatographic columns: a column packed with Silica Gel No. 8 and 5A molecular sieve mesh 80/100. Anaerobic sludge obtained from an active biogas plant in Konopnica, Poland, and incubated for a period of 56 days in bioreactor with a capacity of 100 dm3 was used as inoculum. At the beginning and end of batch fermentation, the contents of the reactors were analyzed for dry matter and dry organic matter, according to Standard Methods . where Eout–energy gained (useful) (MJ ha−1), Ein–energy intake, energy input (MJ ha−1). Apart from the ERoEI index, the Net Energy Value (NEV) ratio is also used in the assessment of the energetic efficiency of the product. The NEV ratio is defined as the difference between the amount of energy gained (Eout) and the amount of energy consumed to make the product (Ein). After determining an amount of biogas obtained from the aforementioned plants the methane content has been determined. As far as biogas is concerned, its calorific value depends on the content of methane, whose high calorific value (HCV) is 39.72 MJ m−3 at 0 °C and 101.325 kPa [26, 27]. Then, the energy gained per 1 ha of the plantation was calculated. where Ein–as in formula (1), ΣEinp–total accumulated energy related with the production of plant raw material (MJ ha−1), ΣEint–total accumulated energy related with the processing of plant raw material into biogas (MJ ha−1). where Einp–as in formula (2), ΣEmat–total energy consumption of the applied materials and raw materials (MJ ha−1), ΣEmt–total energy consumption of the machines and tools applied (MJ ha−1), ΣEf–total energy of the fuel consumed (MJ ha−1), ΣEhl–total energy consumption of the human labor (MJ ha−1). Based on the literature data [28, 29, 38] in the estimation of total energy consumption of the applied materials and raw materials (Emat), following energy equivalents were used: seeds—30 MJ kg −1; for all agrochemicals—250 MJ kg−1; water from the aqueduct 0.02 MJ kg−1; nitrogen—90 MJ kg−1; phosphate—15 MJ kg−1; potassium—10 MJ kg−1. On the other hand, in the estimation of total energy consumption of the machines and tools applied (Emt), following energy equivalent, reflecting parts and materials for machine repairs, was used: 1 PLN was equivalent to 6.67 MJ. However, in the estimation of total energy of the fuel consumed (Ef), the energy equivalent for diesel fuel was set at 43 MJ dm−1; in turn, for the estimation of total energy consumption of the human labor (Ehl), energy equivalent of 100 MJ Mh−1 (Mh—man hour) was assumed. In the studies on the effect of fertilization on the quantity and composition of biogas produced and the yield of biogas production, three plants were analyzed: maize, sorghum and reed canary grass. 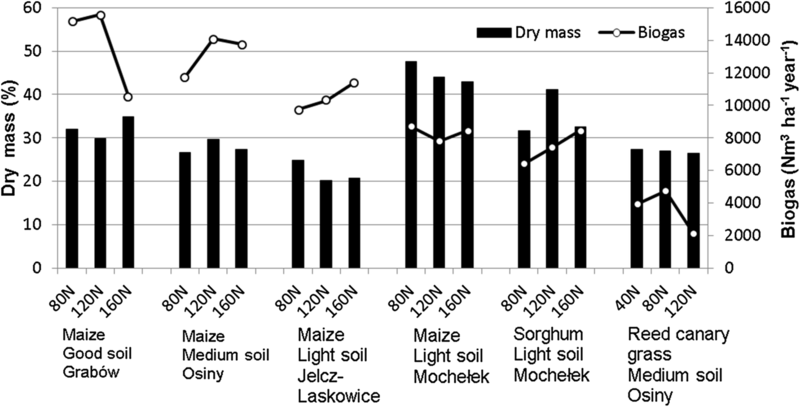 Tables 2 and 3 present the results of the biomass yield and the biomethane potential (BMP) analysis of maize silage from Grabow, Osiny, Jelcz-Laskowice and Mochelek locations and sorghum from Mochelek location for three different nitrogen fertilization levels: 80, 120 and 160 kg N ha−1, and also reed canary grass silage from Osiny with 40, 80 and 120 kg N ha−1 fertilization. In the studies conducted, the highest yield of green mass of maize was obtained on good soil in Grabow (about 50 t ha−1). The yield of sorghum was over 70 t ha−1, and of the reed canary grass was about 40 t ha−1. Increasing nitrogen doses resulted in a slight increase in green mass yield from 1 ha. The highest green mass yield was obtained for the highest nitrogen fertilization of 160 kg N ha−1. Analysis of the results showed that the degree of nitrogen fertilization had a significant effect on the biogas yield of maize silage from different locations, which were characterized by their different soil type. The highest yield of biogas per hectare of Bosman maize silage from Grabow (good soil) and Osiny (medium soil) locations was obtained for middle fertilization level: 120 N (Table 3). Comparing the maize silage by location, silage from Grabow appeared to be the most efficient since the yield of biogas per hectare was 15595 m3 ha−1 year−1 (120 N fertilization rate). Much lower biogas yield has been obtained for Vitras maize silage from Jelcz-Laskowice and Mochelek (light soil) sites, the yield of which was in the range from 9751 to 11412 m3 ha−1 year−1 and from 7810 to 8690 m3 ha−1 year−1, respectively. The BMP analysis was repeated 3 times and each time such low yield of biogas has been obtained. It should be noted that in this case the highest yield has been achieved for maize silage from the Jelcz-Laskowice location with the highest fertilization level (160 N) amounting to 11412 m3 ha−1 year−1. Comparing individual silages due to biogas yield from 1 ton of green mass, it was observed that the highest yield of biogas production has been received from the maize silages with the lowest fertilization level (80 N): for Bosman maize silage from Grabow location 315.33 m3 t−1 green mass (g.m. ), Vitras from Jelcz-Laskowice locality 259.33 m3 t−1 g.m. and Vitras from Mochelek 194.5 m3 t−1 g.m. On the other hand, for Bosman maize from Osiny locality with middle fertilization level: 318.67 m3 t−1 g.m. Dry matter content during maize harvest was 27 to 35% for the Bosman cultivar, and 20 to 48% for the Vitras cultivar (Fig. 1). The highest dry matter content of 43-48% was found for Vitras maize from Mochelek locality (light soil), which was associated with low biogas production from 7810 to 8790 m3 ha−1 year−1. Almost twice higher biogas yield (about 16000 m3 ha−1 year−1) was obtained for Bosman maize from Grabow location (good soil) where the dry matter content was about 30%. The optimum nitrogen dose for maize found by various authors  varies between 90 and 180 kg ha−1. Such different effect of nitrogen doses on maize yield is mainly due to different cultivation methods, and hence the use of different doses, different planting density, harvesting date, limit the length of vegetation period. None of the researchers, however, examined the effect of nitrogen fertilization level on biogas production. Comparison of the results of BMP analysis of three maize silages and three sorghum silages fertilized with 80, 120 and 160 kg N ha−1 from Mochelek location (light soil) showed much higher biogas yields for maize silage than for sorghum (Fig. 1). The highest biogas yield of 194.5 m3 t−1 green mass was obtained from maize silage with the lowest level of fertilization (80 kg N ha−1). On the other hand, in the case of sorghum, the highest amount of biogas (115 m3 t−1 g.m.) was obtained from silage fertilized with the highest dose of 160 kg N ha−1 (Table 3). By analyzing the effect of nitrogen fertilization on the susceptibility of selected silages to decomposition in the processes of methane fermentation and biogas production, the difference in biogas yield was higher for sorghum than for maize. However, higher production of biogas and methane from 1 tonne of green mass and higher yield per hectare of these gases were obtained in the present work from maize silage as compared to sorghum silage, which is confirmed by results of other researchers [31, 32, 33, 34]. For Mochelek location dry matter content in the case of sorghum harvest was lower than for maize ranging from 31 to 41% and from 43 to 48%, respectively (Table 2). Comparing the effect of fertilization on maize and sorghum yield from Mochelek location, it was found that increasing nitrogen doses had little effect on both maize and sorghum yield, which indicates the similar use of nitrogen. Sowinski and Liszka-Podkowa  also suggested that nitrogen fertilization did not significantly affect the yield of fresh and dry matter of sorghum and maize. At the highest level of fertilization equal to 160 kg N ha−1, the yield of green mass of both maize and sorghum was the highest. The yield of sorghum was almost one-and-a-half times higher than that of maize, but such higher value did not translate into the yield of produced biogas. Increasing the level of nitrogen fertilization of maize limited the production of biogas and for sorghum had an impact on increasing the production of biogas, which probably resulted from their quality and chemical composition. Księżak et al. found that regardless of the level of nitrogen fertilization, sorghum contained much more Mg, Ca and K than maize, while the concentration of phosphorus in both species was similar. Increased doses of nitrogen fertilization had no significant effect on Mg, Ca and P content, while they caused a significant increase in potassium concentration in both maize and sorghum. There was also a significant diversification in cellulose fiber content but also in ash content in both sorghum and maize silage . Methane content in biogas for both maize and sorghum was high and ranged from 73 to 79% and from 66 to 73%, respectively. The field experiments of reed canary grass variety Bamse (Osiny locality, medium soil) cultivation showed the increase in green mass yield depending on the fertilization level (Table 2). The biggest difference was noticed when comparing the lowest (40 kg N ha−1) and highest (120 kg N ha−1) dose of nitrogen. Regarding dry matter yield there was no statistically significant differences with respect to applied dose of nitrogen fertilization. This, however, was not reflected in the production of biogas (Table 3). The highest yield of biogas equal to 126 m3 t−1 g.m. was obtained from reed canary grass with applied 80 kg N ha−1 and the lowest one 45.5 m3 t−1 g.m. from the highest level of fertilization (120 kg N ha−1). Allison et al. stated that the use of nitrogen fertilizers can cause an increase in lignin content. In the case of reed canary grass, this increase can affect the growth of the calorific value and improve crop yields. On the other hand it may have a negative effect on the susceptibility of grass to the conversion process such as anaerobic digestion. This can be the reason of low biogas production from the silage with the highest dose of nitrogen (120 kg N ha−1). Comparing the effect of fertilization on the yield and biogas production from maize and reed canary grass from Osiny location (medium soil), it was found that the yield of maize green mass was higher and was 45.9 t ha−1 at nitrogen fertilization level of 80 kg N ha−1. However, at fertilization level of 120 N higher green mass yield was obtained for reed canary grass (46.3 t ha−1). The yield of biogas from 1 ton of green maize was more than double than that of green canary grass for nitrogen fertilization of 80 kg N ha−1 and nearly 7 times higher for nitrogen fertilization of 120 kg N ha−1. Table 3 presents the amount of biogas gained, including the content of methane and the energy gained per 1 ha (Eout) based on calorific value of methane. Comparing the data shown in Table 3, it one can conclude that regardless of the level of fertilization and the type of soil, the highest amount of methane obtained from the unit of area and, as a consequence, the energy obtained, is characterized by the magnitude of maize production. For this plant, methane productivity ranged from 5935 m3 ha−1 year−1 to 12,164 m3 ha−1 year−1. This enabled obtaining energy from 235643 MJ ha−1 to 482,914 MJ ha−1, respectively. Such variation depends primarily on the type of soil. The highest rates of energy gained were obtained on good and medium soils. On good soils, more energy by 37% to 65% has been obtained as compared to light soils. On the other hand, on medium soils, the difference in obtaining energy in relation to light soils ranged from 26% to 53% in favor of medium soils. The level of nitrogen fertilization was the second factor affecting the content of energy. On light and medium soils there were no visible differences in the content of energy. Fluctuations in the indicator ranged from 14% in light soils to 18% in medium soils. In both soil types, the highest amounts of energy were obtained at the highest level of N fertilization (160 kg N ha−1). A slightly different relationship was revealed in good soils. Here, in turn, the lowest index of obtained energy was recorded at the highest fertilization level N (160 kg N ha−1). The highest content of energy was obtained at the second fertilization level (120 kg N ha−1), where the indicator was by 50% higher than the maximum level of N fertilization (160 kg N ha−1). Similarly, with the lowest fertilization level N, this difference was lower being slightly over 40%. In the case of the other two plants–sorghum and reed canary grass, generally the content of energy to be released is lower in relation to maize. In the case of sorghum, which was grown on light soils, the decrease in energy efficiency in relation to maize cultivated on the same type of soil averaged from 25 to 50%. However, in the case of reed canary grass, which was grown on medium soils, the decrease in energy efficiency in relation to maize cultivated on the same soil type averaged at as much as 420%. The energy intake (Ein) presents the other aspect of the energy balance. As it has been shown in the methodology, this publication will present the amount of accumulated energy related to the raw material production and its transportation to the place of processing (Einp). Table 4 shows the results of investigations into this issue. The volumes of four basic streams of energy were calculated for each of the plants under investigation, allowing for the pre-set level of fertilization by nitrogen. Because the level of nitrogen fertilization was the key factor differentiating the technologies for a particular plant, the stream of energy related with fertilization was enhanced in the stream of accumulated energy linked with materials and raw materials. Upon the analysis of the data presented in Table 3 it is noticeable that the technologies with the highest level of nitrogen fertilization (160 N) are characterized by the highest energy inputs—from 50 to 53 GJ ha−1 in the case of maize, around 46 GJ ha−1 in the case of sorghum and around 31 GJ ha−1 in the case of reed canary grass (120 N). In the case of maize, regardless of the soil type, the differences in energy inputs were similar. Energy inputs at the level of fertilization 160 kg N ha−1 was higher on average by 17% compared to the level of fertilization 80 kg N ha−1. In the case of 120 kg N ha−1 the difference was approximately 8%. In the structure of energy streams the highest inputs are related with the stream of fuel consumed (Ef) and it makes between 60% and 68% of the total energy inputs. The energy inputs related with the preparation and transportation of silage were the dominant outlay in this stream. The same trend can also be seen in the study by Pepliński . As for the two remaining plants, in the case of sorghum grown on light soils, the level of energy inputs compared to maize cultivated on the same type of soil does not differ. On the other hand, within sorghum, slightly bigger differences occur due to the fertilization levels of N. The energy inputs at the fertilization level of 160 kg N ha−1 were higher by an average of 24% compared to the fertilization level of 80 kg N ha−1. In contrast, in the level of 120 kg N ha−1, this difference amounted to approximately 12.5%. In the case of reed canary grass grown on medium soils, the level of energy inputs compared to maize cultivated on the same type of soil differs significantly, namely it is lower by about 50%. Also, higher variation of energy inputs occurs at different fertilization levels of nitrogen. The energy inputs with the highest fertilization level of 120 kg N ha−1 for reed canary grass were higher by an average of 42% compared to the fertilization level of 40 kg N ha−1. In contrast, in the case of 80 kg N ha−1, this difference was around 22%. As follows from the data shown in Table 4, the highest ERoEI (Energy Return on Energy Investment) ratio exists for plants produced for biogas processed from maize. This ratio ranges from 5.05, in the production of maize on the light soil at the level of nitrogen fertilization 120 kg N ha−1, up to 9.76—the highest efficiency, which is achieved at the lowest level of nitrogen fertilization, i.e. 80 kg N ha−1 on the good soil. In general, the diversity of ERoEI and NEV indicators due to the fertilization level of N was low for sorghum grown on light soils and maize cultivated on light and medium soils (Fig. 2). In these cases, the fluctuation of the indicators ranged from 2 to 9%. However, significant differences occurred in the case of maize cultivated on good soils and reed canary grass grown on medium soils. In the case of reed canary grass, the highest indicators were obtained with an average fertilization level of 80 kg N ha−1. However, it should be noted, that from the viewpoint of the ERoEI and NEV indicators, this plant proved to be the least efficient regarding energy gained (Fig. 2). In the case of maize cultivated on good soils, with the fertilization level N of 120 kg N ha−1 and 80 kg N ha−1, the highest levels of both indicators were obtained. The highest level of ERoEI - 9.76 was achieved at the lowest level of fertilization, i.e. 80 kg N ha−1 - over 60% more than at the level of 160 kg N ha−1. In turn, the highest NEV level–433263 MJ ha−1, was obtained with the average fertilization level of N equal to 120 kg N ha−1, which was more than 60% obtained energy in relation to the energy obtained at the highest level of nitrogen equal to 160 kg N ha−1. Arodudu et al. presenting the case study of biogas production from maize feedstock, found that the individual as well as combined effect of agronomic factors (farm power, irrigation, tillage, fertilizer, seed-sowing options) may improve the energy productivity of arable bioenergy sources considerably in terms of the NEV from between 39 and 118.4 GJ ha−1 to between 127.9 and 257.9 GJ ha−1 and ERoEI (from between 4.3 and 12.1 to between 15 and 33.9). This therefore underscores the need to factor in local and regional agronomic factors into energy efficiency and sustainability assessments . The results of presented studies indicate that both fertilization level and soil quality influence the susceptibility of selected silage to decomposition in the processes of methane fermentation and biogas production. When comparing the effect of fertilization on yield of maize, sorghum and reed canary grass, it was found that increasing nitrogen doses had little effect on the yield of these crops. Only a slight increase in green mass from 1 ha was observed. The highest green mass yield was obtained for the highest nitrogen fertilization of 160 kg N ha−1 (maize and sorghum) and 120 kg N ha−1 (reed canary grass). Moreover, the highest yield of green mass of maize was obtained on good soil in Grabow (about 50 t ha−1). The yield of sorghum was higher than 70 t ha−1, and the reed canary grass about 40 t ha−1. In most locations, the lowest fertilization level of 80 kg N ha−1 fostered the efficient production of biogas from 1 ton green mass. Increasing the application of fertilization dose to 160 kg N ha−1 did not significantly reduce the yield of biogas from 1 ton green mass except for the Grabow location (good soil), where significant reduction was observed. The highest biogas yield (over 300 m3 from 1 ton green mass) produced from maize silages from Grabow locality (good soil, 80 N) and Osiny (medium soil, 120 N) was observed by analyzing the susceptibility of maize silages from four different locations with differentiated quality, on methane fermentation and biogas production. The yield of biogas from maize silage derived from light soil at the location of Jelcz-Laskowice (259.33 m3 t−1 g.m., 80 N) and Mochelek (194.5 m3 t−1 g.m., 80 N) was lower. The highest yield of biogas per hectare of maize silage of Bosman Osiny and Bosman Grabow has been obtained in the case of 120 kg N ha−1 level of fertilization, that is 15,595 m3 ha−1 year−1 and 14,117 m3 ha−1 year−1, respectively. On the other hand, on the light soil in Jelcz-Laskowice location, the highest yield of biogas per hectare was obtained for the highest degree of fertilization of 160 kg N ha−1 (11,412 m3 ha−1 year−1) and in Mochelek with the lowest fertilization rate of 80 kg N ha−1 (8690 m3 ha−1 year−1). High yield of sorghum green mass did not contribute to high production and biogas yield. The highest biogas yield from 1 ton of green mass of sorghum (115 m3 t−1 g.m.) was obtained for the highest fertilization level of 160 kg N ha−1. In the case of reed canary grass the potential biogas yield of 1 ton green mass was small at about 125 m3 t−1 g.m. for 40 kg N ha−1 and 80 kg N ha−1 fertilization levels. However, the increase of nitrogen caused a significant reduction of biogas production and its yield to about 45 m3 t−1 g.m. Methane content in biogas from maize and sorghum was high being above 70% and about 50% for reed canary grass. The investigations evidenced that in general, the production technologies of crops where the low levels of nitrogen fertilization were applied proved to have the highest energy efficiency. Depending on the soil type, ERoEI and NEV values for maize ranged from 5.05 and 188,945 MJ ha−1 (light soil), obtained at the level of 120 kg N ha−1 to 9.76 obtained at the level of 80 kg N ha−1 and 433 263 MJ ha−1 obtained at the level of 120 kg N ha−1 (good soil). The obtained levels of indicators turned out to be higher by as much as 60% in relation to the level of indicators obtained at the highest level of fertilization—160 kg N ha−1. For sorghum (light soil) values of about 5.2 and 200 000 MJ ha−1 were appropriately obtained at the level of 160 kg N ha−1. In turn, in the case of reed canary grass the highest ERoEI and NEV values obtained at the level of 80 kg N ha−1 amounted to 3.8 and 74 000 MJ ha−1 (light soil), respectively. The work was funded by the European Union under the Operational Programme “Innovative Economy” 2007–2013: POIG.01.03.01-00-132/08-00 (European Regional Development Fund), “The Development of a Species Index and Optimization of Production Technologies for Selected Energy Crops”.